Now that you have learned so much about Bacillus cereus, I am going to give you some interesting facts about it! Here I have split the facts into two categories: toxins and random facts! Is Bacillus cereus poisonous or venomous? What is the difference? In order to be considered venomous, the organism must inject or deliver the venom with a type a specialized apparatus (spiders and their fangs). To be poisonous, is to deliver the toxin indirectly. These become harmful when they are either touched or i ngested. 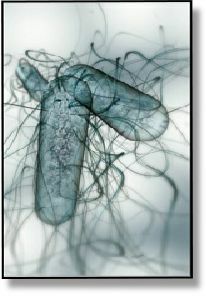 Being that humans become infected when ingesting Bacillus cereus, it can be classified as being poisonous. How is Bacillus cereus poisonous? By now you have read several times about how Bacillus cereus can either make some one vomit, or have diarrhea. But how does it manage to give you these symptoms? Well, it is all due to three of the enterotoxins that Bacillus cereus produces: non-hemolytic enterotoxin (Nhe), hemolysin BL (HBL), and cytotoxin K. The three enterotoxins are responsible for the side of effects of ingesting Bacillus cereus. The exact mechanism by which Bacillus cereus enterotoxins cause diarrhea and vomiting is unknown. All three enterotoxins are proteins, and to view the chemical sturctures of Nhe and HBL, click here. How do I prevent myself from getting contaminated? As talked about in adaptations, Bacillus cereus is very difficult to fully get rid of. To ensure the greatest chance of prevention, keep hot foods at a temperature of sixty degrees Celsius or higher, reheat foods to seventy-four degrees Celsius, and keep cold foods under four degrees Celsius. How do I know if I am contaminated? What do I do if I am? If you are contaminated, vomiting will occur between thirty minutes to six hours after ingestion, or/and diarrhea like symptoms will occur six to fifteen hours after ingestion. Both symptoms have a duration period of twenty-four hours. If experiencing these symptoms, there is usually no need to go to a hospital, just drink plenty of fluids to prevent hydration and get plenty of rest. What happens if I take someone on a date and become poisoned by Bacillus cereus? Although I might have put together a pretty good web page, there is no answer to this question. My suggestion would be if you are the one picking the date location, stay away from the Chinese buffets. If you are the one who is being asked on the date, avoid the person who suggests your first date should be at a Chinese buffet. Who is the closest relative to Bacillus cereus? The closest relative to Bacillus cereus is Bacillus thurbingeisis. The two are so closely related, that they are often mistaken for one another, and in my research were mentioned together in the majority of the articles I read. Anthrax? 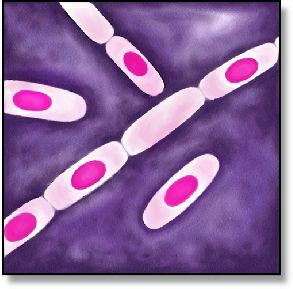 Bacillus cereus is closely related to the species Bacillus anthracis, which is the causative agent of anthrax. Why choose to research Bacillus cereus? My interest in Bacillus cereus came about due to my organismal Biology class where I was first introduced to different types of bacteria. I was amazed at the ability of Bacillus cereus to survive all the efforts by humans to get rid of it, and how such a small organism could have effects on organisms as large as us human beings. Check out who provided me with all this information here!